In demand in Manchester media! I reported in these pages a week or two ago that the Manchester Evening News had used one of my photos. I can now report that its sister paper – the Manchester Weekly News; a freebie delivered around the region – has done the same. Or rather, it has done more, having used two of my photographs. 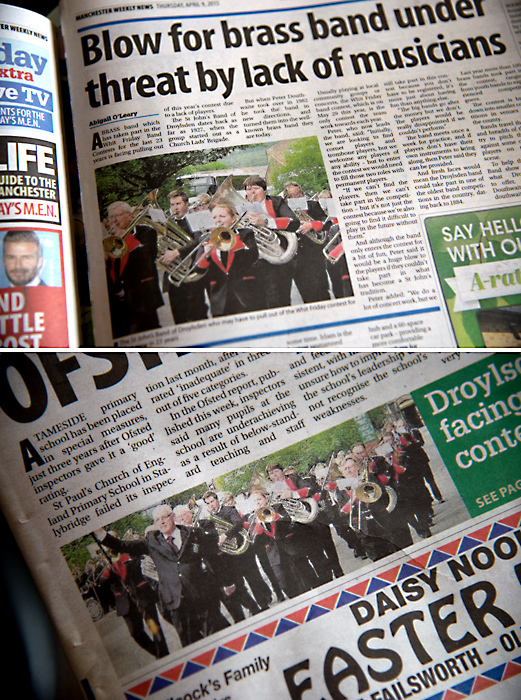 The photos are almost identical and from the same event: the Whitsun Brass Band Competition, in Stalybridge last June. The shots have been cropped, however – for convenience or disguise?! They show Droylsden Brass Band, marching and playing. The two shots were taken consecutively, a few seconds apart. But, regardless, I won’t be pinging off an invoice. I took the photos to help with the band’s publicity and that’s what they are being used for here. The news is not good, however; the story is the same as in the Evening News, that the band is in danger of folding, due to lack of members. Anyone interested in learning how to play a brass instrument and in joining the band should contact them directly, or I can pass a message on if you contact me via this site.